The Indian Arya Necklace, an extremely complex example of the goldsmith's art, executed by the traditional jewelry craftsmen of Bikaner, in Rajasthan, India, in the 19th century, was first part of an exquisite collection of jewelry that belonged to Madame Ganna Walska, the Polish born renowned opera singer, who captured the attention of audiences in the west, on both sides of the Atlantic, in the early 20th century. Madame Ganna Walska's jewelry collection included several pieces of Indian origin, such as the diamond pendant necklace, diamond pendant clip, diamond pendant earrings and the Champa-Kali ruby and diamond cluster bracelet. On April 1, 1971, Doris Duke, the American tobacco heiress, philanthropist and art collector, acquired the Indian Arya Necklace, at a Park-Bernet Galleries sale known as "the Important Jewelry Collection of Madame Ganna Walska." The necklace which was lot no. 102 in the sale, was purchased for $2,600 by Doris Duke. Madame Ganna Walska, who was a nature lover and garden designer, sold part of her jewelry collection in 1971, in order to finance one more shipment of rare plants for her final creation, the "Cycad Garden" at her 37-acre Botanical Garden at Santa Barbara, California, known as "Lotusland," which was bequeathed together with her fortune, at the time of her death in 1984 to the "Ganna Walska Lotusland Foundation." Thus the name of the necklace quite appropriately reflects the names of the two previous owners of the necklace. This elaborate and complex necklace, which represents the peak of refinement and advancement in jewelry crafting in 19th-century India, is made up of a variety of gemstones, such as diamonds, emeralds, sapphires, rubies and seed pearls, set in gold, and the reverse of the necklace covered with polychrome enamel, whose function is believed to be two-fold, to preserve the original gold content of the necklace, and increase the rigidity of the component parts of the necklace. The diamonds, sapphires and rubies in the necklace are placed in "kundan settings" The pearls and emeralds are combined together as pendants on the lower half of the necklace and as a row of spikes right at the top of the necklace. The blue sapphires are placed in two rows of "kundan" settings in the upper half of the necklace, one just below the upper layer of pearls and the other above the halfway region of the necklace, just below the zone of diamond rosettes. The upper row of blue sapphires are placed in oval shaped kundan settings, with its long axis parallel to the vertical. The lower row of blue sapphires are also placed in oval-shaped "kundan settings" but the long axis of the oval areas are perpendicular to the vertical. The area between the two rows of blue sapphires is a zone of diamonds placed in "kundan" settings resembling rosettes or lotus flowers, with diamonds occupying the petals of the flowers, and the center of the flowers occupied by a large round-shaped cabochon ruby or diamond, placed alternately. The region between the lower row of blue sapphires and the halfway mark of the necklace, is occupied by three rows of rhomboidal or square shaped "kundan" settings with diamonds in the center. The halfway mark of the necklace is just below the rhomboidal or square-shaped "kundan" zone. The lower half of the necklace which is wider than the upper half is totally occupied by four rows of triangle shaped "kundan" settings" with a triangle-shaped diamond in the center. The size of the triangles increase from top to bottom. Provision has been made for the suspension of pearl and emerald pendants, from the lower side of each triangle. In the upper most row of triangles, three pendants are suspended from the lower side of each triangle. In the second row, below this, four pendants are suspended from below each triangle. In the third row five pearl and emerald pendants are suspended from each triangle. In the fourth and the last row, six pendants are suspended from each triangle. From the lower row of triangle shaped "kundan" settings, along the median line of the necklace and from either side of it, three rhomboidal shaped "kundan" settings are suspended, with nine pearl and emerald pendants hanging from each one of them. The central rhomboidal setting is slightly larger than the two rhomboids on either side. Each of the rhomboidal "kundan" settings is occupied by a centrally placed rhomboidal diamond. Silk cords placed on either side of the necklace are used for wearing the necklace around the neck. Thus in this elaborate "Arya" necklace two halves can be distinguished. A narrower upper half which fits around the neck, and a wider lower half which rests on the upper part of the chest. The technique used in setting the diamonds, sapphires and rubies in the Arya necklace is known as "kundan" an ancient technique exclusively used in India for setting gemstones on gold and silver jewelry, before the introduction of claw settings from the west in the 19th century. The emperors of the Mughal empire who ruled India from 1526 to 1858, were great patrons of the art, literature and poetry. Among the arts that flourished during this period were the decorative arts such as jewelry crafting and the performing arts such as dance and music. Jewelry designing and crafting reached a climax during this period and was given a big boost, as not only the emperor, but also his wives and other members of the royal family bedecked themselves with the most exquisitely crafted jewelry during their appearances at the royal court. Apart from Delhi and Agra, Jaipur in Rajasthan also became a center of jewelry production during this period, and several families of artisans in Jaipur, had for generations worked for the Mughal courts in Delhi and Agra. It was during this period the art of Kundan work known as "kundankari" reached Rajasthan from Delhi. Due to the patronage extended by the members of the royalty, the nobility such as the Rajputs and the feudal lords, "kundan" work attained a high state of perfection during this period, and Rajasthan became the hub of "kundankari" in the entire subcontinent. Definition of the word "kundan"
The word "kundan" means "refined gold," the material that is normally used for "kundan' settings. Silver can also be used for "kundan" settings. The word "kundan" is now identified with the process by which gemstones are embedded on gold and silver ornaments. Like modern-day diamond cutting and polishing that is carried out in a series of steps, each by a different craftsmen specialized in that step, "kundankari" is also a specialized job carried out by a series of craftsmen, each carrying out a specific task. The different steps of "kundan settings" carried out in succession by the "Chiterias," "Ghaarias," "Meenakaris," "Sunars," and "Jadiyas." The first group of craftsmen are known as the "Chiterias" who make the basic design in gold or silver. The next group known as the "Ghaarias" are responsible for engraving and making holes, inside which the gemstones are set. The third group known as "Meenakaris" perform the polychrome enameling of the reverse of the piece of jewelry, which induces rigidity to the components of the piece of jewelry, as well as maintaining its gold content. The next step is the most important step carried out by the "Sunars" or the goldsmiths, embedding the gemstone in gold. Lac, which is a natural resin is first poured into the holes where the gemstones are to be set. Over the lac, highly refined melted gold, known as "Kundan" is poured into the hole. The gold is allowed to cool, and while it is still pliant, the gemstones are pushed into the "kundan," by the stone setters known as the "Jadiyas." Diamonds, emeralds, rubies, sapphires, jade, agate, garnets, amethyst, spinel, topaz and rock crystals are some of the common gemstones used in "kundan" settings. When the gold finally hardens, the gemstones get embedded in it, giving a strong permanent mount, even stronger than the modern claw settings. More "Kundan" is applied around the edges of the gemstones to strengthen the setting, as well as giving it a neat appearance. The edges of the "kundan" settings are therefore raised up, and the gemstone is situated within these raised edges. Kundan jewelry can be easily identified by these raised edges along the contour of the design. In the Doris Dukes's Arya necklace, such raised edges can be seen in the lotus flower, rhomboidal and triangle setting of diamonds, oval settings of blue sapphires and the round setting of rubies in the center of the lotus flower. The gemstones used in the Arya necklace are diamonds, sapphires, rubies, emeralds and pearls. Being a 19th-century necklace, the source of the diamonds in the necklace can still be India, either from the overexploited diamond mines on the river basis of the eastern Deccan plateau, where sporadic mining had still been taking place before the mines were finally abandoned towards the end of the 19th century. Alternatively the diamonds could have come from the diamond fields of Brazil, where diamonds were discovered in the early 18th-century by the Portuguese colonizers, significant quantities of which reached the western diamond markets and through them the courts of some Indian Maharajahs. The diamonds could also have from pieces of old Indian jewelry which were dismantled for recasting into new jewelry, in which case the source still remains Indian. The source of the blue sapphires in the necklace was undoubtedly Sri Lanka, the world's most prolific source of blue sapphires since very ancient times, and India's closest neighbor, separated from the Indian mainland only by a shallow sea known as the Palk Straits. In the late 19th century blue sapphires were also discovered in Kashmir, but were soon exhausted. The Kashmir blue sapphires have set the standard in the world for the highest quality blue sapphires known as cornflower blue sapphires. The three large cabochon rubies in the necklace might have originated in Myanmar (Burma), large quantities of which reached the Indian market after the discovery of rubies in Burma in the 16th century. The Burmese rubies fetched high prices in the Indian jewelry markets during the period of the Moghul empire, and most of the annual production of rubies in Burma were just sent across the border to India, reaching Kolkata, from where they reached the other jewelry manufacturing centers. The source of the emeralds in the necklace, was undoubtedly Colombia, large quantities of which reached the Mughal empire via Madrid in Spain. The Mughal emperors had a special liking for the brilliant green emeralds from Colombia, and the art of engraving emeralds was perfected during this period, most of which were incorporated in jewelry originating from this period. The pearls in the Arya necklace, most of which have the popular white color, originated either from the pearl banks in the Gulf of Mannar, between India and Sri Lanka, or the pearl banks of the Persian Gulf. Pearls from the Gulf of Mannar were said to be superior in quality to the Gulf pearls, having the pure white color, unlike the Gulf pearls which had a slightly yellowish tinge. Rajasthan is a state with rich cultural traditions, a treasure-trove of Indian arts and crafts, particularly the decorative arts, prominent among which were the art of processing gemstones including diamonds and jewelry crafting, which incorporated the processed gems into a variety of male and female jewelry. The arts and crafts of Rajasthan prospered due to the patronage of the royalty and nobility that ruled India, particularly the long period of rule of the Mughal emperors. Some of the arts and crafts that received royal patronage included, carving on wood, marble, sandstone, quartz and ivory; weaving of carpets and textiles; pottery; painting such as wall painting, fabric painting and miniature painting; puppetry; embroidered leather work; the processing of precious and semi-precious stones; the designing and manufacture of jewelry, including "Kundankari," "Meenakari" (enameled jewelry) and Jadau. Jaipur, the capital of Rajasthan, founded in 1727, is the main center of the gem and jewelry trade in Rajasthan today. However, previously other cities like Jodhpur and Bikaner were also centers where the gem and jewelry industry flourished. The Doris Duke/Ganna Walska Arya necklace was created by the traditional jewelry craftsmen of Bikaner, in Rajasthan, India, in the 19th century. Bikaner is a historic city founded in 1488, by a descendant of the founder of Jodhpur, named Rao Bikaji. The city is located in northwestern Rajasthan, amidst the Thar desert, and has a typical desert climate, with very little rainfall and extreme temperatures, with a hot summer season sometimes exceeding 50Â°C and a cool winter season, when the temperature drops down to the freezing point. The city is famous for its rich historical tradition and culture, consisting of beautiful forts, castles, religious shrines and other historical monuments. Bikaner is also famous for its desert camels, camel safaris, and the camel festival held annually in the month of January. Bikaner has earned an international reputation as the home for Asia's biggest camel farm, The city is encircled by high fortifications, consisting of a 7 km long wall that bounds the old city, which has five entrances. Bikaner occupied an important position on the ancient caravan routes, serving as a trading center for merchants coming from West Asia (Middle East) and Central Asia. Previously Bikaner was the capital city of the princely state of Bikaner, but when Rajasthan State was created in 1947, Bikaner became the capital of Bikaner District, the largest district in Rajasthan, situated in the northwestern region of the state. The most prosperous period in Bikaner, was under the reign of Maharajah Ganga Singh, who built modern Bikaner as we see it today. Bikaner still maintains some of its ancient artistic traditions, and is well known today for its handicrafts and leather articles, as well as the 16th to early 20th century painting techniques known as "Usta Art." 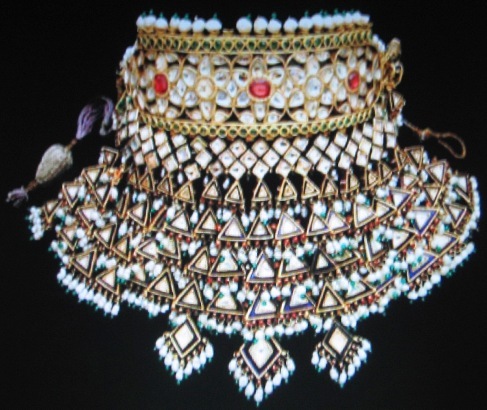 Bikaner also maintained its traditional jewelry industry, such as "Kundankari" and "Meenakari" and hence in the 19th century was able to create the Doris Duke/Ganna Walska Arya necklace, that combined both these techniques. Born Hanna Puacz in 1887 in Brest-Litovsk, Poland, at the time part of the Russian Empire, she pursued a career as an opera singer, taking the stage name of Madame Ganna Walska. The appellation Madame was traditionally used to refer to well-known actresses and operatic singers in Europe at that time. Ganna is the Russian form of the name Hanna, and Walska apparently refers to her favorite music, the waltz. Early in her career, as an adolescent, she drew the attention of a Russian count, Baron Archadie d'Eighnhorn, an officer in the Russian army, whom she married in St. Petersburg, but divorced him in 1914 due to his drunken habits. She left Russia during the upheavals of the Bolshevik Revolution of 1917, and continued to pursue her singing career in the 1920s and 1930s in Europe and across the Atlantic in America. She married her second husband Dr. Julius Fraenkel, a renowned New York Endocrinologist, who died in 1919. Soon after that she took her third husband Alexander Smith Cochran, a multimillionaire sportsman and carpet tycoon, who was said to be the richest bachelor in the world, but that marriage too ended in divorce in 1920. She then married industrialist Harold Fowler McCormick, who took an active part in promoting her career in the 1920s. 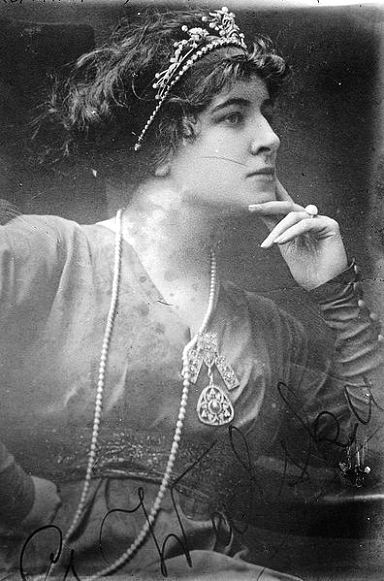 Madame Ganna Walska sang in New York and Paris, and also toured America and Europe, attracting the attention of audiences, critics and gentleman admirers, on both sides of the Atlantic. Her marriage to McCormick was perhaps the longest surviving one lasting over 10 years, and ended in divorce in 1931. Madame Ganna Walska was now 54 years old, and even at this age, men fell in love with her after spending just days or hours in her company. However, she was now growing tired of married life, and was getting spiritually inclined, studying spiritual teachings in search of creative fulfillment and personal enlightenment. It was then that she met her sixth and last husband, Theos Bernard, who too was spiritually inclined like her, and was a scholar of Yoga and Tibetan Buddhism. In 1941, Bernard encouraged her to purchase the 37-acre Cuesta Linda estate in Santa Barbara, California, with the intention of using it as a retreat for Tibetan Buddhist monks. She renamed the estate as "Tibetland." However, the monks were unable to visit the United States, because of wartime restrictions on visas to the United States. In spite of their spiritual affinities, Madame Ganna Walska's marriage to Theos Bernard, lasted only for about five years, ending with divorce in 1946. In 1946 after her 6th marriage ended in divorce she settled to a life of "retirement" in her estate in California, "Lotusland"
After her sixth marriage ended in divorce, Walska decided to remain single. She changed the name of her estate in California, to "Lotusland" after the sacred Lotus flower (Nelumbo nucifera) growing in the ponds of her garden, that was sacred not only to Tibetan Buddhists, but all Buddhists around the world. Madame Ganna Walska settled to a life of "retirement" in "Lotusland" occupying the Spanish-style house inside the estate. While settling down in "Lotusland," Walska had actually gone into retirement from her busy life as an opera singer. This did not mean that she had settled to a life of total relaxation. What actually took place was a transformation from her role as a well-known socialite to an entirely new role as a garden designer. In fact her role as a garden designer was more demanding than her previous role as an opera singer, and consumed most of her time, energy and resources. She transformed her "Lotusland" into a botanical garden of rare plants, using her natural artistic talents, and creating a fantasy world of exquisite beauty. She was assisted in achieving her horticultural ambitions by a number of specialists in the field of landscape architecture, such as Lockwood de Forest Jr., Ralph T. Stevens, William Paylen, Oswald da Ross and Charles Glass. But the overall landscaping decisions were in her hands, and she took the final decision on all aspects of designing. She designed and created over a dozen unique gardens, each with its own unique collection of plant species, from all over the world, usually belonging to a single genera, family, order or class, such as the Aloe garden, and the Cycad garden. She always went for the most unusual and best plants available, and was willing to pay any price to get them. Her unshakable determination in completing the work she started was clearly demonstrated in 1971, when she auctioned off some of her jewelry, including the Doris Duke/Ganna Walska Arya necklace, the subject of this webpage, in order to finance one more shipment of rare plants, to complete her final creation the Cycad Garden. Lotusland was originally owned in the late 19th century by Ralph Kinton Stevens, himself a gardener, horticulturist and commercial plant nursery owner, who lived with his family in his house inside the estate. Most of the large palms and other trees that stand in the estate today were planted during his period. Stevens died in 1896, and his widow sold the property long after his death, in 1913, to George Owen Knapp, who later sold it in 1916 to E. Palmer and Marie Gavit of New York. The Gavit family constructed their main residence, designed by Reginald Johnson, inside the estate in 1919. They lived in the estate until 1938, and during this period the house was remodeled, and additional buildings constructed, designed by George Washington Smith, who also designed the perimeter wall and the original swimming pool which is now the lotus pond, and the adjacent bath house. 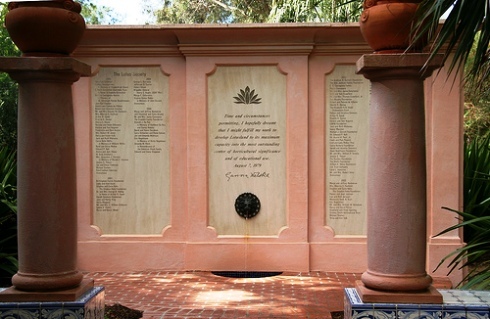 The Gavit family employed the services of landscaping architects like Paul Theine, Peter Reidel and Lockwood de Forest, and converted the estate into a well designed garden, and named it "Cuesta Linda." In 1938, a British diplomat, Sir. Humphrey O. Clarke purchased "Cuesta Linda" from the Gavit family, and occupied the property with his family from 1939 to 1941. He is believed to have made some architectural modifications to the main residence but the garden itself was left untouched. Madame Ganna Walska Plaque at the entrance to lotus land. It was from the Clarke's family that Madame Ganna Walska, purchased "Cuesta Linda" in 1941, with the intention of converting it into a "meditation center" for the Tibetan Buddhist monks. But, when her original plans did not materialize due to unforeseen circumstances, she decided to convert the estate to a botanical garden, a safe ecological niche not only for rare indigenous species but also rare exotic species from the far corners of the world, with the dual purpose of enhancing the aesthetic beauty of the estate, as well as conserving some of the rare species in the world. Any casual visitor to the "Lotusgarden" would agree that Madame Ganna Walska had undoubtedly achieved her first goal of enhancing the beauty of the estate, but to some extent she has also achieved her goal of conservation, as some rare species of plants, such as the Cycad, Encephalartos woodi is today found only in "Lotusland" and extinct in the wild all over the world. The scientific community no doubt recognizes her services and efforts at conservation, and perhaps had decided to honor her by naming the exotic tropical "Water Lily" as Nymphaea x 'Madame Ganna Walska." At the time of her death in 1984, at the age of 97, she left "Lotusland" and her fortune to the non-profit Ganna Walska Lotusland Foundation, with the condition that the gardens be open to the public. Accordingly, the foundation that manages the estate today, has opened the gardens for guided public tours, conducted by personnel known as "docents" who have undergone extensive training in giving public tours. The public tours start at a new visitors center, established in the estate's 1920s Spanish colonial revival bathhouse, that was designed by George Washington Smith. The newly created "Australian garden" with exotic species from Australia, surrounds the visitor's center, whose vegetation contrasts dramatically, with the long-established vegetation beyond the entrance to the garden. Out of the 13 distinct gardens in the estate connected by well-maintained pathways, two of the more fanciful ones are the "Theatre Garden" and the "Topiary Garden." The "Theatre Garden" depicts a troupe of 17th-century stone figures on the lawn against a backdrop of fern pines. In the "topiary garden" large evergreen animals graze around a giant in-ground clock. The "Blue Garden" is the home to some of the oldest trees on the estate, consisting of magnificent Chilean wine palms, growing alongside blue Atlas cedars. The palms were planted more than a 100 years ago by the first owner of the estate, Ralph Kinton Stevens. The blue-grey succulent Senecio mandraliscae and a dense ground cover of ornamental blue fescue, together with large pieces of blue-green glass edging the pathway, complete the bluish effect that the name of the garden denotes. The "Aloe Garden" contains more than 100 different species of Aloe, from different parts of the world, from the tree to the ground-hugging types, with their usual spiny, fleshy, sword-shaped leaves, and inflorescences of a variety of colors, such as vermilion, coral and yellow. In the center of this garden is a shallow pond, with lustrous abalone shells fringing its edges, into which two giant clamshell fountains spill water. The "Cycad Garden" Walska's last creation in the 1970s, with 370 specimens from all over the world, that look like chubby palms to the common layman, but are actually primitive cone-bearing plants related to the conifers, is considered by many horticulturists as the most important collection in the estate, and one of the finest in the world, including species that are now extinct. The lotus flowers (Nelumbo nucifera) from which the garden gets its name, was first introduced by Ralph Kinton Stevens in 1893, and the aquatic plant with its large round leaves waving on slender stalks above the water, are found in the "Japanese Garden" pond and the water garden near the bathhouse. Water lilies (Nymphaea x Madame Ganna Walska), including the giant Amazon water lily, also grow in these ponds. One of the gardens is an oak grove, highlighted by the pinks and purples of hundreds of bromeliads, floral relatives of the pineapple. The drive leading to the entrance of the estate's Spanish style house built in 1919, which is now the foundation's office, not open to the public, is lined by spiny golden barrel Cactus, with towering Euphorbia ingens plants, standing guard at the entrance. At the time Doris Duke first visited India, in 1935 as a part of her worldwide honeymoon tour, India and its culture were still quite mysterious to most people in the west including the United States. She was entranced by the decorative arts and architecture she saw in India. Indian decorative arts, including the manufacture of jewelry was alive and well at that time, employing thousands of craftsmen, and supported by over 600 pre-independence princely states. The ready availability of gemstones, such as diamonds from Golconda, rubies from Burma, sapphires from Sri Lanka, emeralds from Colombia, pearls from the Persian Gulf and Sri Lanka, and enormous supplies of semi-precious stones from local sources, and the large pool of skilled craftsmen available in the country, were some of the factors responsible, for maintaining the long tradition of jewelry designing and crafting in the country. During her first trip to India, whatever information she gathered about Indian jewelry came from the wives of British Colonial officers she happened to meet at that time, and not from the users of such jewelry, the Indian women, who were still leading an isolated existence, and socialization with indigenous males, or foreigners both male and females was still taboo. However, Doris Duke did develop a passion for Mughal architecture during her first trip, after her visit to Mumtaz Mahal's mausoleum the Taj Mahal, built by her beloved husband, Emperor Shah Jahan. She was so entranced by the Mughal architecture, that she hired an architect in Delhi to design door and windows, to be fabricated and inlaid with gemstones, such as jade, agate, malachite, lapis lazuli and mother-of-pearl by craftsmen in Agra, to be shipped later to America. She later incorporated these doors and windows, when she built her new house in Hawaii, Shangri La, which today houses her extensive collection of Islamic art, and is presently owned and managed by the Doris Duke Foundation for Islamic Art (DDFIA). Doris Duke might have purchased some Indian jewelry during her first trip to India, but her actual collection of Indian jewelry began during her subsequent trips to the sub-continent in the pursuance of her other passions, such as collection of Islamic Art. She developed a special liking for Indian jewelry designs, and during her frequent trips to the country purchased a variety of jewelry, both antique as well as contemporary designs. 25 Diamonds, colored stones, pearl and gold Arya necklace diamonds, blue sapphires and rubies in kundan settings; beaded pearls, and seed pearls, emeralds; gold, silk cord; reverse with polychrome enamel. 19th-century Bikaner, Rajasthan.Purchasedi in 1971 from Madame Ganna Walsk's collection at Parke-Bernet Galleries Sale. 26 Champa-Kali ruby and diamond cluster bracelet Rubies, diamonds in kundan settings; gold reverse with polychrome enamel. Late 17th or early 18th century India. Purchased in 1971, from Madame Ganna Walska's collection at Parke-Bernet Galleries Sale. 27 Diamond pendant necklace Diamonds and platinum not known India. Purchased in 1971, from Madame Ganna Walska's collection at Parke-Bernet Galleries Sale. The above summary of Doris Duke's Indian Jewelry collection provides some interesting information. 1) Most of the jewelry pieces (13 out of 27) she purchased originated in the capital city of Rajasthan, Jaipur, or another city in Rajasthan like Bikaner. The origins of other pieces are :- 2 pieces from Delhi; 2 pieces from Tamilnadu; 1 piece from Hyderabad; 8 pieces from India (state unspecified), 1 piece from Northern India. Thus it appears that she purchased most of the pieces of jewelry from cities she visited in Northern India, such as Delhi and Jaipur in Rajasthan. She might also have purchased pieces of jewelry from Bombay, the commercial capital of India, and the main gem jewelry market for several centuries. 2) The last three pieces (25, 26 and 27) were purchased from Madame Ganna Walska's collection in 1971, at Parke-Bernet Galleries sale. 3) The collection consists of 3 armlets, 4 bangles, 4 bracelets, 1 belt, 1 cigarette holder, 2 ear ornaments, 1 hair ornament, 1 hand ornament, 8 necklaces, and 2 pendants. 4) The period of origin of the jewelry pieces are as follows :- 1 piece fro the 17th century; 2 pieces from the 18th century; 11 pieces from the 19th century; 5 pieces from the 20th century; 3 pieces from late 18th or early 19th century; 3 pieces from late 19th or early 20th century, and 2 pieces of unknown period of origin. Thus 17 pieces of jewelry originated in the 19th-century or before. Only 5 pieces are of 20th-century origin. Thus most of her pieces of jewelry can be regarded as antique. Only 5 pieces are of recent origin. 5) Most of the pieces of jewelry (20 pieces) have their gemstones set in kundan settings, with polychrome enamel (meenakari) deposited on the reverse. The combination of "kundankari" and "meenakari" in jewelry is characteristic of jewelry produced in Northern India, particularly in cities like Jaipur and Bikaner in Rajasthan. The two pieces of jewelry from Tamilnadu, in South India, do not have polychrome enameling (meenakari) on the reverse. 6) 19 pieces of jewelry have diamonds in their setting. This is obvious as India was the only country in the world where diamonds were produced since ancient times, and production continued until the end of the 19th-century. 14 pieces of jewelry contain rubies, that originated in Myanmar (Burma). 11 pieces of jewelry contain pearls, that came from Sri Lanka or the Persian Gulf. 4 pieces of jewelry contain sapphires that also originated in Sri Lanka. 6 pieces contain emeralds that originated in Colombia. Historical significance of the Doris Duke/Ganna Walska Arya Necklace. The Doris Duke/Ganna Walska Arya Necklace has great historical significance not only because it was designed and created in the 19th century, but also because it came to be owned by two of the most prominent and illustrious ladies in history, Madame Ganna Walska, the renowned Polish soprano and Doris Duke, the American tobacco heiress, philanthropist and art collector. The necklace with its complicated design is a rare and unique piece of jewelry that combines two of the most popular techniques in jewelry crafting, "kundankari" and "meenakari" for which Rajasthan had been famous since ancient times. Jaipur, the capital of Rajasthan, is one of the main centers of the gem and jewelry industry, today in India. 1) Gems From The East And West - The Doris Duke Jewelry Collection. Janet Zapata, Ulysses Dietz, Zette Emmons. Published by Doris Duke Charitable Foundation. 650, Fifth Avenue, 19th Foor, New York.